For Damascus Twist barrels, see Skelp. For the album of the same name, see Damascus Steel (album). The steel is named after Damascus, the capital city of Syria and one of the largest cities in the ancient Levant. It may either refer to swords made or sold in Damascus directly, or it may just refer to the aspect of the typical patterns, by comparison with Damask fabrics (which are themselves named after Damascus). Damascus blades were first manufactured in the Near East from ingots of wootz steel that were imported from India, as well as Sri Lanka. The Arabs introduced the wootz steel to Damascus, where a weapons industry thrived. From the 3rd century to the 17th century, steel ingots were being shipped to the Middle East from India. Production of these patterned swords gradually declined, ceasing by around 1750, and the process was lost to metalsmiths. Several modern theories have ventured to explain this decline, including the breakdown of trade routes to supply the needed metals, the lack of trace impurities in the metals, the possible loss of knowledge on the crafting techniques through secrecy and lack of transmission, suppression of the industry in India by the British Raj, or a combination of all the above. 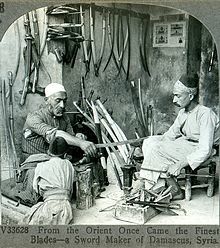 The original wootz was imported from India to Damascus, where Middle Eastern bladesmiths forged them into swords. Due to the distance of trade for this steel, a sufficiently lengthy disruption of the trade routes could have ended the production of Damascus steel and eventually led to the loss of the technique in India. As well, the need for key trace impurities of tungsten or vanadium within the materials needed for production of the steel may be absent if this material was acquired from different production regions or smelted from ores lacking these key trace elements. The technique for controlled thermal cycling after the initial forging at a specific temperature could also have been lost, thereby preventing the final damask pattern in the steel from occurring. Recreating Damascus steel is a subfield of experimental archaeology. Many have attempted to discover or reverse-engineer the process by which it was made. Pattern on modern "Damascus knife"
Since the well-known technique of pattern welding - the forge-welding of a blade from several differing pieces - produced surface patterns similar to those found on Damascus blades, some modern blacksmiths were erroneously led to believe that the original Damascus blades were made using this technique. However today, the difference between wootz steel and pattern welding is fully documented and well understood. Pattern-welded steel has been referred to as "Damascus steel" since 1973 when Bladesmith William F. Moran unveiled his "Damascus knives" at the Knifemakers' Guild Show. This "Modern Damascus" is made from several types of steel and iron slices welded together to form a billet (semi-finished product), and currently, the term "Damascus" (although technically incorrect) is widely accepted to describe modern pattern welded steel blades in the trade. The patterns vary depending on how the smith works the billet. The billet is drawn out and folded until the desired number of layers are formed. To attain a Master Smith rating with the American Bladesmith Society that Moran founded, the smith must forge a Damascus blade with a minimum of 300 layers. J. D. Verhoeven and A. H. Pendray published an article on their attempts to reproduce the elemental, structural, and visual characteristics of Damascus steel. They started with a cake of steel that matched the properties of the original wootz steel from India, which also matched a number of original Damascus swords that Verhoeven and Pendray had access to. The wootz was in a soft, annealed state, with a grain structure and beads of pure iron carbide, which resulted from its hypereutectoid state. Verhoeven and Pendray had already determined that the grains on the surface of the steel were grains of iron carbide—their goal was to reproduce the iron carbide patterns they saw in the Damascus blades from the grains in the wootz. Although such material could be worked at low temperatures to produce the striated Damascene pattern of intermixed ferrite and cementite bands in a manner identical to pattern-welded Damascus steel, any heat treatment sufficient to dissolve the carbides would permanently destroy the pattern. However, Verhoeven and Pendray discovered that in samples of true Damascus steel, the Damascene pattern could be recovered by aging at a moderate temperature. They found that certain carbide forming elements, one of which was vanadium, did not disperse until the steel reached higher temperatures than those needed to dissolve the carbides. Therefore, a high heat treatment could remove the visual evidence of patterning associated with carbides but did not remove the underlying patterning of the carbide forming elements; a subsequent lower-temperature heat treatment, at a temperature at which the carbides were again stable, could recover the structure by the binding of carbon by those elements. In Russia, chronicles record the use of a material known as bulat steel to make highly valued weapons, including swords, knives, and axes. Tsar Michael of Russia reportedly had a bulat helmet made for him in 1621. The exact origin or the manufacturing process of the bulat is unknown, but it was likely imported to Russia via Persia and Turkestan, and it was similar and possibly the same as Damascus steel. Pavel Petrovich Anosov made several attempts to reproduce the process in the mid-19th century. Wadsworth and Sherby also researched  the reproduction of bulat steel and published their results in 1980. 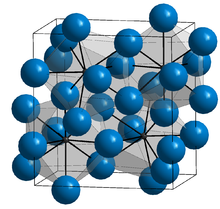 Cementite crystal structure. Iron atoms are in blue, carbon atoms are in black. A team of researchers based at the Technical University of Dresden that used x-rays and electron microscopy to examine Damascus steel discovered the presence of cementite nanowires and carbon nanotubes. Peter Paufler, a member of the Dresden team, says that these nanostructures are a result of the forging process. Sanderson proposes that the process of forging and annealing accounts for the nano-scale structures. Prior to the early 20th century, all shotgun barrels were forged by heating narrow strips of iron and steel and shaping them around a mandrel. This process was referred to as "laminating" or "Damascus". These types of barrels earned a reputation for weakness and were never meant to be used with modern smokeless powder, or any kind of moderately powerful explosive. Because of the resemblance to Damascus steel, higher-end barrels were made by Belgian and British gun makers. These barrels are proof marked and meant to be used with light pressure loads. Current gun manufacturers make slide assemblies and small parts such as triggers and safeties for Colt M1911 pistols from powdered Swedish steel resulting in a swirling two-toned effect; these parts are often referred to as "Stainless Damascus". The exceptionally strong fictitious Valyrian steel mentioned in the television series Game of Thrones, as well as George R. R. Martin's book series A Song of Ice and Fire, appears to have been inspired by Damascus steel. ^ Figiel, Leo S. (1991). On Damascus Steel. Atlantis Arts Press. pp. 10–11. ISBN 978-0-9628711-0-8. ^ Goddard, Wayne (2000). The Wonder of Knifemaking. Iola, WI: Krause Publications. pp. 137–145. ISBN 978-0-87341-798-3. ^ Williams, Alan R. (2003). The knight and the blast furnace: a history of the metallurgy of armour in the Middle Ages & the early modern period. History of warfare. 12. Leiden: BRILL. pp. 11–15. ISBN 978-90-04-12498-1. ^ a b c d e f Verhoeven, J.D. ; Pendray, A.H.; Dauksch, W.E. (1998). "The key role of impurities in ancient damascus steel blades". Journal of Metallurgy. 50 (9): 58. Bibcode:1998JOM....50i..58V. doi:10.1007/s11837-998-0419-y. ^ a b c d e Wadsworth, Jeffrey; Sherby, Oleg D. (1980). "On the Bulat – Damascus Steel Revisited". Prog. Mater. Sci. 25 (1): 35–68. doi:10.1016/0079-6425(80)90014-6. ^ Becker, Otto Matthew (1910). High-speed steel: the development, nature, treatment, and use of high-speed steels, together with some suggestions as to the problems involved in their use. New York: McGraw-Hill. pp. 10–14. ^ a b Reibold, M.; Paufler, P.; Levin, A. A.; Kochmann, W.; Pätzke, N.; Meyer, D. C. (2006). "Materials: Carbon nanotubes in an ancient Damascus sabre". Nature. 444 (7117): 286. Bibcode:2006Natur.444..286R. doi:10.1038/444286a. PMID 17108950. Lay summary – New Scientist. ^ Fountain, Henry (2006-11-28). "Antique Nanotubes". New York Times. Retrieved 2011-11-13. ^ Juleff, G. (1996). "An ancient wind powered iron smelting technology in Sri Lanka". Nature. 379 (6560): 60. Bibcode:1996Natur.379...60J. doi:10.1038/379060a0. ^ Sinopoli, Carla M. (2003). The Political Economy of Craft Production: Crafting Empire in South India, c. 1350–1650. Cambridge University Press. p. 192. ISBN 0-521-82613-6. ^ a b Milgrom, Lionel (15 November 2006). "Carbon nanotubes: Saladin's secret weapon". Royal Society of Chemistry. ^ Lewis, Jack; Roger Combs (1992). Gun digest book of knives. DBI. pp. 58–64. ISBN 978-0-87349-129-7. ^ a b c Kertzman, Joe (2007). Art of the Knife. Krause Publications. pp. 224–6. ISBN 978-0-89689-470-9. ^ Loveless, Robert; Barney, Richard (1995) . How to Make Knives. Knife World Publications. p. 169. ISBN 0-695-80913-X. ^ Kochmann, W.; Reibold, Marianne; Goldberg, Rolf; Hauffe, Wolfgang; Levin, Alexander A; Meyer, Dirk C; Stephan, Thurid; Müller, Heide; Belger, André; Paufler, Peter (2004). "Nanowires in ancient Damascus steel". Journal of Alloys and Compounds. 372: L15–L19. doi:10.1016/j.jallcom.2003.10.005. ISSN 0925-8388. Levin, A. A.; Meyer, D. C.; Reibold, M.; Kochmann, W.; Pätzke, N.; Paufler, P. (2005). "Microstructure of a genuine Damascus sabre" (PDF). Crystal Research and Technology. 40 (9): 905–916. doi:10.1002/crat.200410456. ^ a b Sanderson, K. (2006). "Sharpest cut from nanotube sword". Nature. 444: 286. doi:10.1038/news061113-11. ^ a b c d Simpson, Layne (2003). Shotguns & Shotgunning. Krause Publications. p. 256. ISBN 978-0-87349-567-7. ^ a b c d Matunas, Edward A. (2003). Do-It-Yourself Gun Repair. Woods N' Water. p. 240. ISBN 978-0-9722804-2-6. ^ Hopkins, Cameron (2000). "Damascus Knight .45". American Handgunner Magazine. 20 (4): 128. ^ The Daily Telegraph. "There's a real-life equivalent to Valyrian Steel". Archived from the original on 19 September 2018. Retrieved 19 September 2018. "Damascene Technique in Metal Working"
Verhoeven, J.D. ; Pendray, A.H.; Dauksch, W.E. (September 2004). "The continuing study of damascus steel: Bars from the Alwar Armory". JOM. 56 (9): 17–20. Bibcode:2004JOM....56i..17V. doi:10.1007/s11837-004-0193-4. Verhoeven, J.D. (2007). "Pattern Formation in Wootz Damascus Steel Swords and Blades" (PDF). Indian Journal of History of Science. 42 (4): 559–574. Loades, Mike; Pendray, Al (21 November 2017). 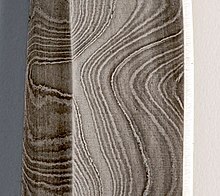 The Secrets of Wootz Damascus Steel. YouTube.